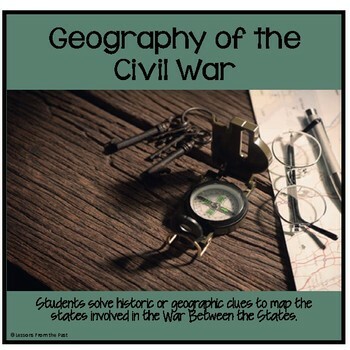 Students will create a map of the states involved in the American Civil War by solving geographic or historic clues about each state. 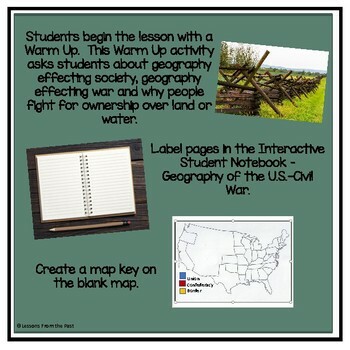 The lesson begins with a warm up in which students ponder how geography can effect societies and effect a war. To understand the differences between the Union and Confederacy, geography must be understood. Pairs work together to solve clues, map the states and color them according to their alliance with the Union or Confederacy. Border states are also identified. 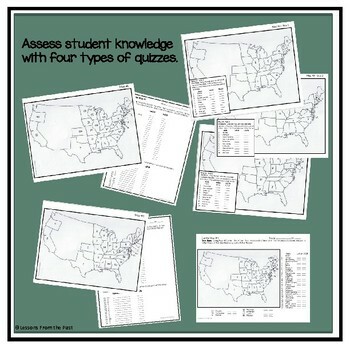 Finally, students complete one of several quizzes provided. Do you like this style of teaching? Check out other activities at Lessons From the Past. Underground Railroad Quilt Codes - Folklore or Fact? Close Reading the Gettysburg Address - Does It Have Meaning Today? Please go to your My Purchases page (you may need to login). Beside each purchase you’ll see a Provide Feedback button. Simply click it and you will be taken to a page where you can give a quick ranking and leave a short comment for the product. Each time you give feedback, TPT gives you feedback credits that you use to lower the cost of your future purchase. I value your feedback greatly as it helps me determine which products are most valuable for your classroom so I can create more for you. ©2019 Lessons From the Past. By purchasing this product, the buyer has obtained the lesson for single classroom use only. No part of this lesson may be reproduced and transmitted without written permission from the author. This lesson may not be copied for other teachers or organizations including but not limited to a grade level, a department, a building or a district without purchasing further licenses. This product may not be displayed digitally for public view. Please do not upload to an individual web page or school web site. Failure to comply is a copyright infringement and a violation of the Digital Millennium Copyright Act (DMCA). All images have been obtained from public domain or purchased at Fotolia/Adobe Stock. Fonts are provided by KG Fonts. Please review all product descriptions and previews. If you have a question, contact me before you purchase. As this is a digital product, all sales are final.